Campaign refined emails are the key. Can't just put it in the byte bucket. Everyone is too busy. Lead Gnome is that solution to find the pockets of value the rest of the market is ignoring. Matt Benati didn't see any solution to accomplish what he needed, so he built it. It's looking for insights into the internal buying machines. Surprising enough you can gain a lot of insights from "out of office" messages. You will basically be given the org chart of the company. They looked at trigger events and campaigns around bounces. A bounced email happens when someone leaves the company. "Matt's no longer with the company, but Sally is here..." This gives you a lot of information and opportunity for an introduction and you can look for Matt at his next company, which is probably in a similar position. You can get two contacts from the one bounce. Who did Matt replace? Where did Sally leave to take Matt's old job? This is 4 contacts from one bounce. This is about unpacking the information in the body of the email, this is not scraping. This is human written information in the body. This was just in the first 8 minutes. You need this replay! 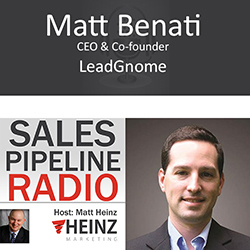 Matt Benati is the CEO and Co-founder of LeadGnome, an innovative Account Based Intelligence web service that mines email responses to deliver account-specific contacts, enhance existing leads, and provide actionable sales intelligence. Matt is a passionate believer that sales and marketing alignment, transparency, and communication optimize revenue generation, and he champions this philosophy in his teams and writings. He participates actively in the market-changing FlipMyFunnel, Account Based Marketing, and Account Based Everything communities. Matt is a contributor at the Account-Based everything hub. Matt’s previous positions include VP Marketing at LogMeIn, VP Global Marketing at Attunity and senior roles at Netezza and IBM. You can follow Matt on Twitter at @mattbenati. Campaign refined emails are the key. Can't just put it in the byte bucket. Everyone is too busy. Lead Gnome is that solution to find the pockets of value the rest of the market is ignoring. Matt didn't see any solution to accomplish what he needed, so he built it. It's looking for insights into the internal buying machines. Surprising enough you can gain a lot of insights from "out of office" messages. You will basically be given the org chart of the company.